My life is full of Giggles and Wiggles these days! We have a new addition to our family and you may have noticed him on my social media channels, but we got a new puppy! Most people think we’re crazy since we have a 4 year year old and a 1 year old, but having them experience a puppy has been so much fun. So, I like to introduce Rowan! 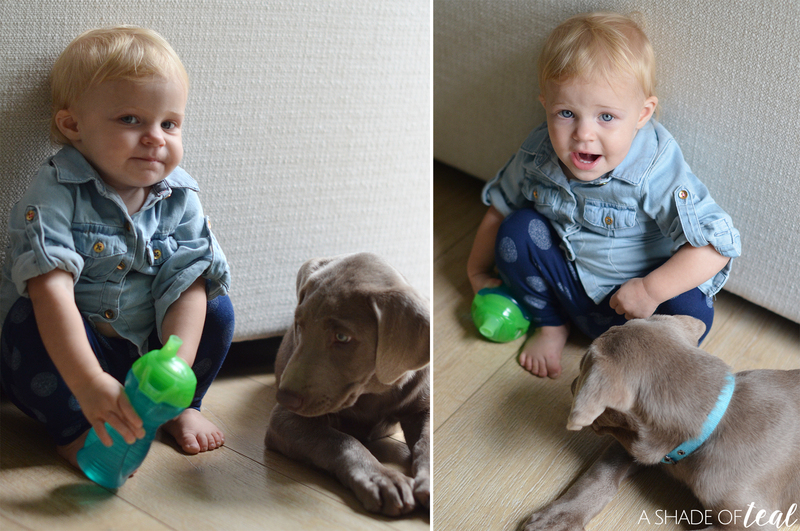 He’s a pure bred silver lab, and we absolutely love him! But, I’m not going to lie, trying to introduce a baby and a puppy can be challenging. I’m here to give you some tips from my experience. Make playtime fun with toys they both can appreciate. My daughter loves all the squeaky toys! Encourage playtime. My pup has started nipping quite a bit, but I don’t want my daughter to fear him. So I encourage play time every day. I make sure to monitor both of them closely and with each day it’s gotten better. So much so, she’s getting unwanted kisses! 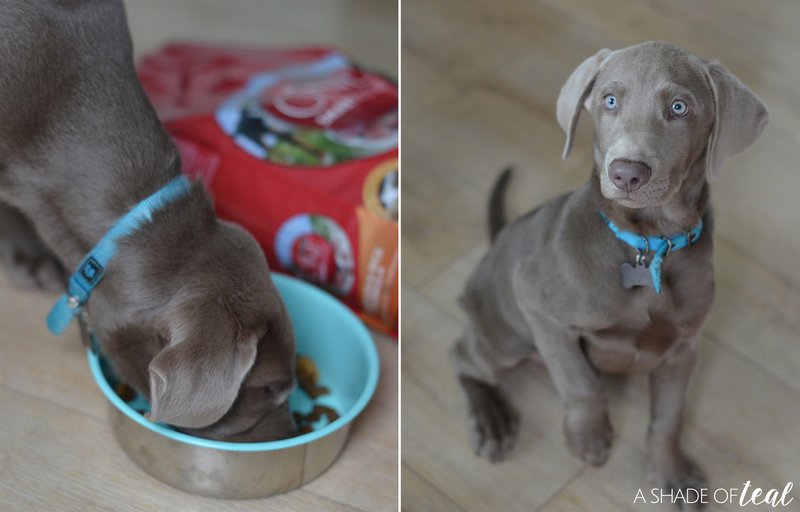 Make them both happy and have full bellies before playtime. 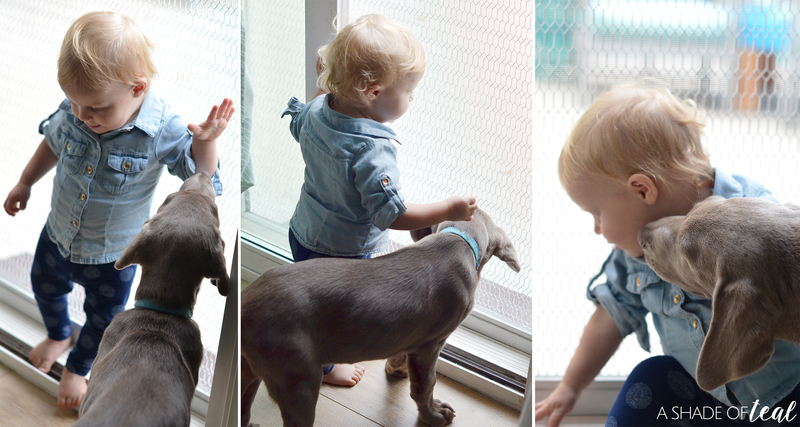 Having a cranky baby or even a puppy can make playtime hectic. I make sure both are fed and are happy, and both get their favorite snacks. 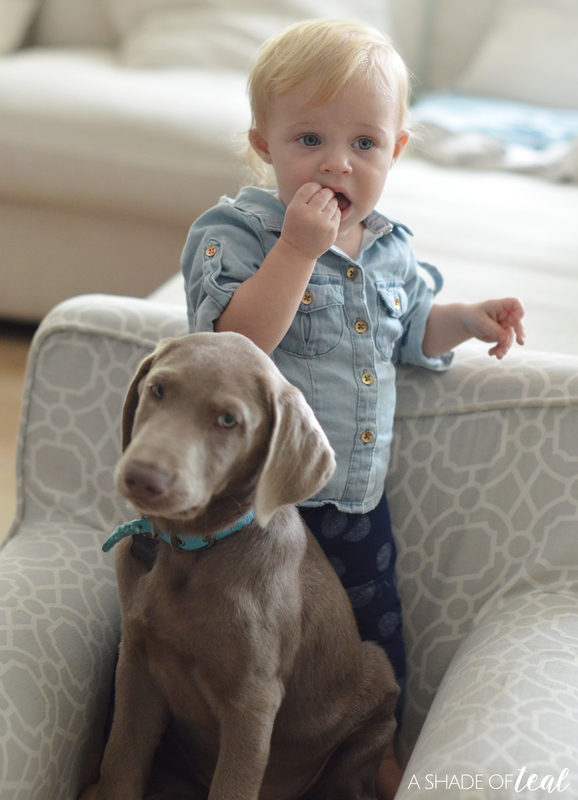 My daughter loves her Gerber® Grabbers Fruit and Yogurt Squeezable Puree in Strawberry Banana, while my pup (Rowan) loves his Purina® ONE® Dog Smartblend in Chicken & Rice. Best part, I can get all their favorite snacks at Target. 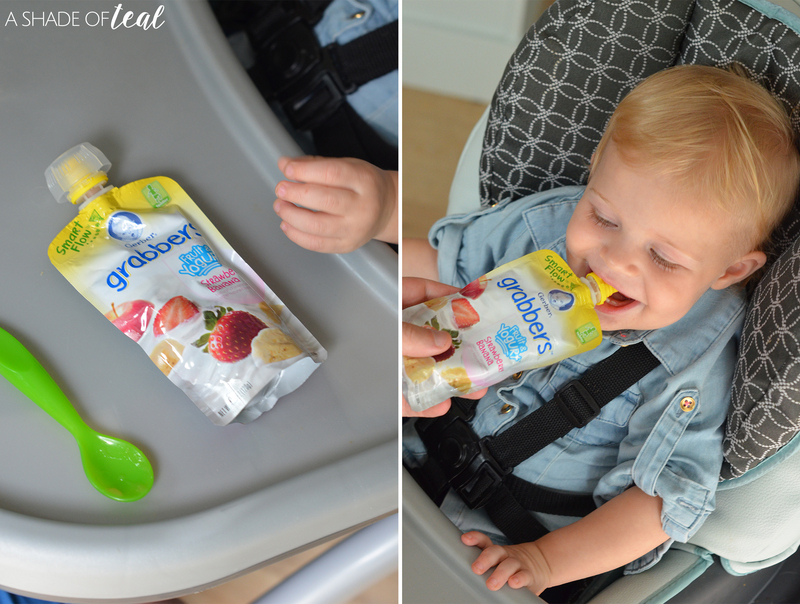 If your not familiar with Gerber® Grabbers pouches, well they feature Gerber’s proprietary Smart Flow spout that helps control the amount of food that comes out. So finally the Smart Flow spout gives tiny hands BIG control! 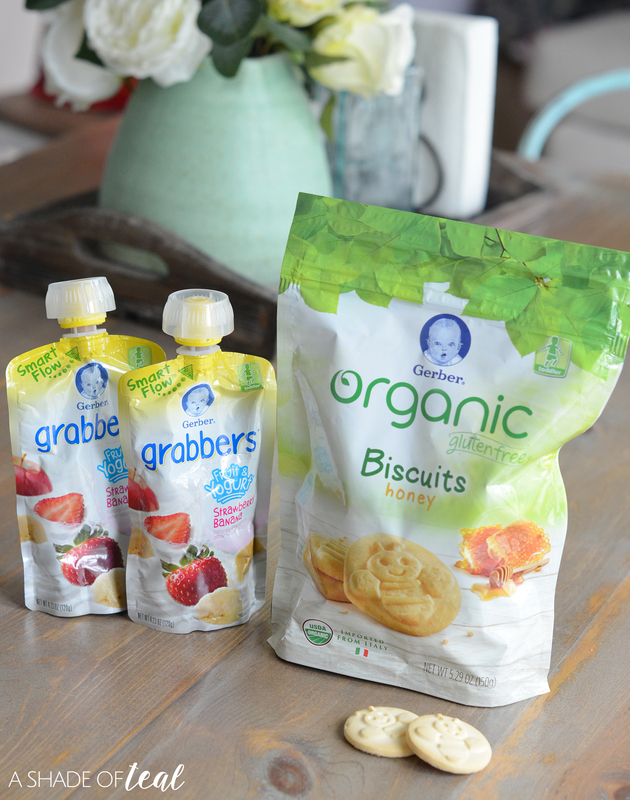 Another snack time favorite is Gerber’s® new Organic Gluten Free Honey Flavored Biscuits. 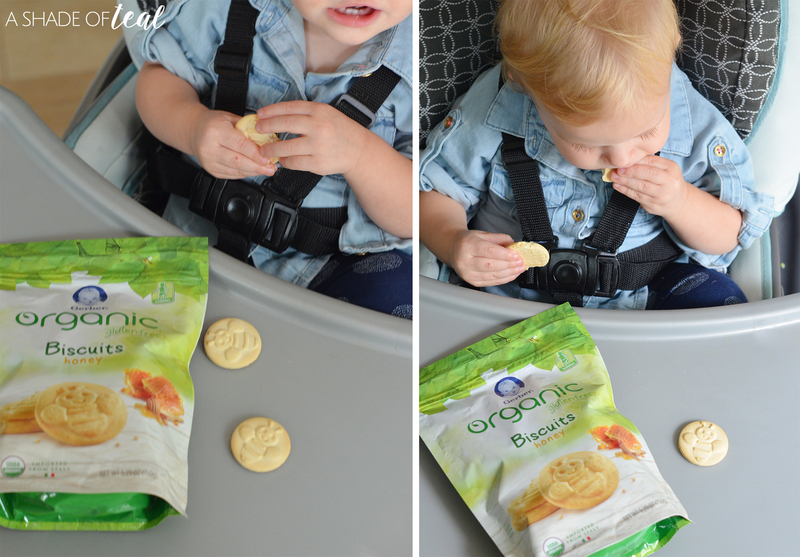 They’re organic and gluten free, and my daughter loves them! 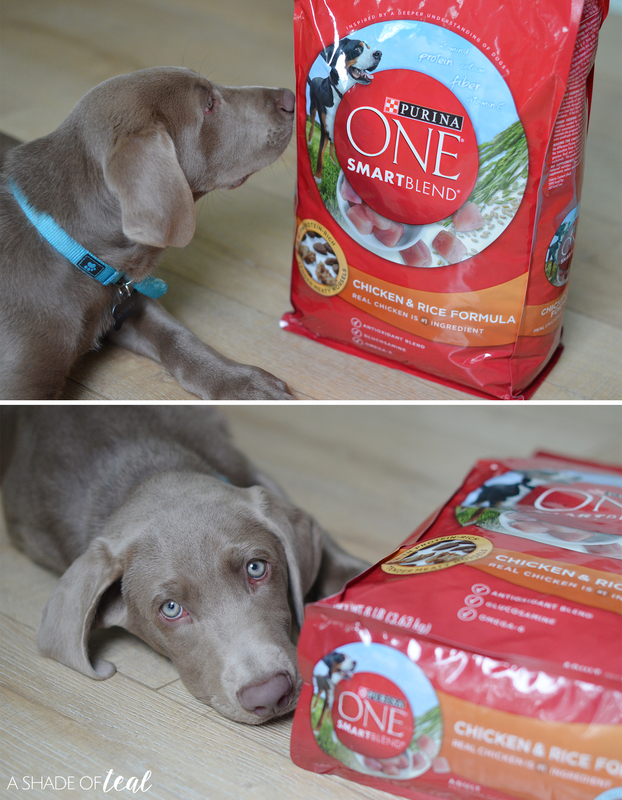 However, when it comes to my pup he’s already fallen in love with Purina® ONE® Dog Smartblend in Chicken & Rice. It’s made with real chicken and blended with other high-quality protein sources that help support strong muscles and a healthy heart. Every parent thinks their baby is the next “Gerber baby” and every year Gerber parents anxiously await the announcement of the next Baby Search. Now in it’s 8th year, Gerber is ready to shake things up and to make sure that this program is new, relevant and bigger than ever. This year’s program will leverage social sharing for parents to enter their baby’s photo using the #GerberPhotoSearch2017. Gerber.com will feature a dedicated promotional page, announce surprise and delight weekly contests, and share many of those precious photos of babies. One Grand Prize winner will receive $50,000 plus the title of 2018 Gerber baby. Parents may enter a photo of their baby for a chance to be the next Gerber Baby who may be featured in paid media and Gerber’s social channel. The grand prize winner will walk away with $50,000. **To enter this portion of the competition the photo only needs to include your child. Photo search begins on 9/13/17, ends 10/27/17. You may enter by posting a photo of your child on Instagram (must be a public account) using the hashtag #GerberPhotoSearch2017 and you can enter up to 10 times. Additionally, there will be Six (6) weekly winners for the Baby & Pet photo search. Each weekly winner will receive a $500 prize pack, 1 year supply of Gerber baby food (valued at $600), 1 year supply of pet food (valued at $540). Parents may enter a photo of their pet and baby for a chance for the weekly winner and will be featured on Gerber.com or social media channels for the week. **To enter this portion of the competition the photo would need to include pet and baby. Refer to the Official Rules for additional information. So, I hope you’ll go enter both contests and pickup all your baby and puppy supplies at Target. 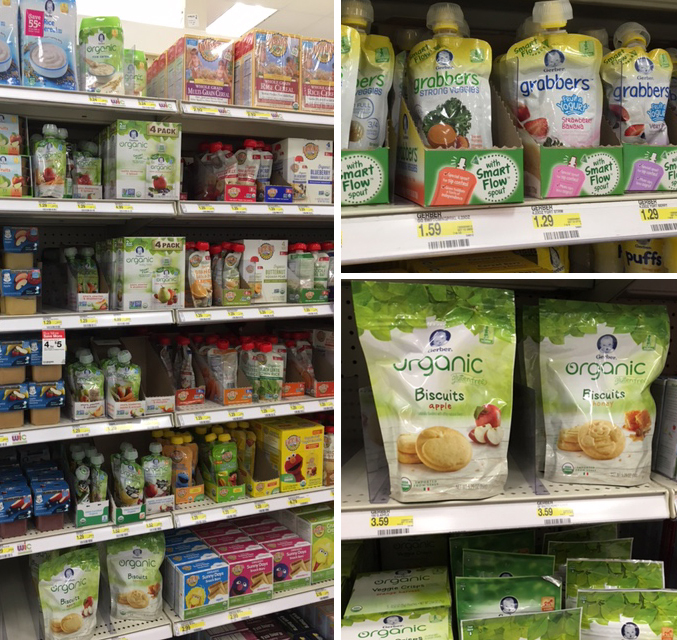 You can find all the Gerber products on the baby food aisle. 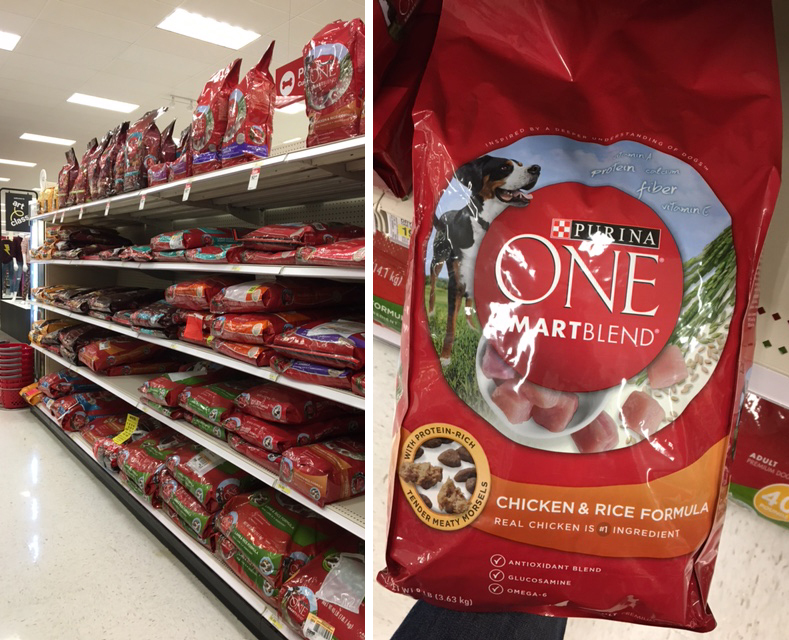 While you can find all Purina products in the pet aisle. 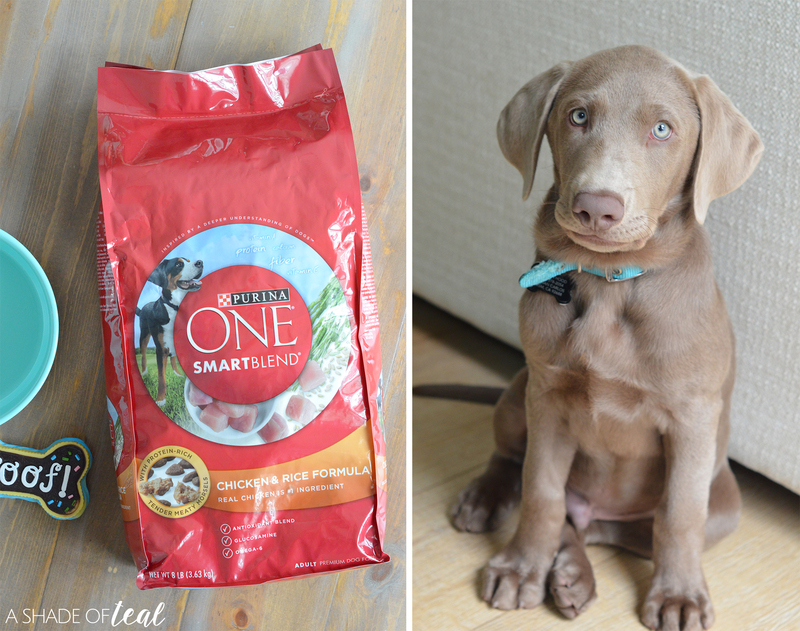 Have you ever dealt with a baby and a new puppy? I would love to know your tips and advise. « Halloween Coffin Graveyard BOO Kit! A puppy sounds like a lot of work. I am glad that you are helping the puppy bond with the baby. Wow what an outstanding post. This is such an important topic for a lot of families, I think you will spread some great suggestions for safer bonding. These photos are adorable. My friend has a two year old little girl and they are bringing home a puppy next weekend. I will have to share this great post with her. Your puppy looks adorable. 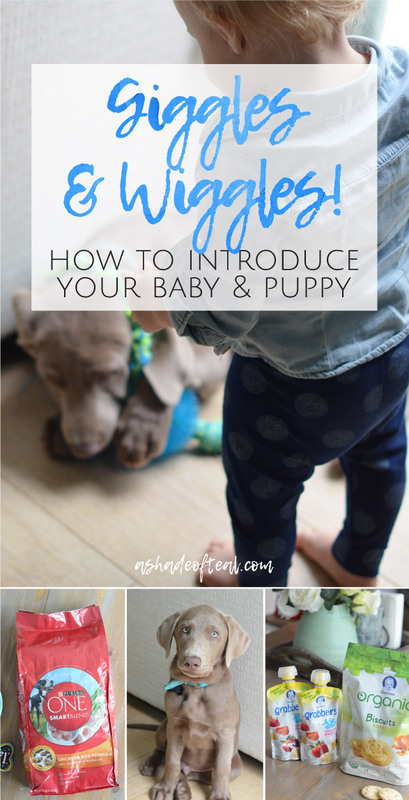 These are all great tips for introducing a puppy to your family! Such great photos. You do have to be careful about getting together puppys with little children. Both puppy and your daughter look amazingly gorgeous! Your baby and puppy are both so cute! These are some great tips on introducing the two. I have two kids with a third on the way and three dogs. My kids were born at home and got to meet the new babies right away. awww, they’re both cute! They’ll grow up to be best buddies. Thanks for sharing these helpful tips! These are all really great tips and ideas! I’ll definitely have to keep these in mind if I ever decide to let my son get a dog! Thanks for sharing!